Tori-Bayashi is played in the way where Dashi (festival car) passes for the first time. Tori-Bayashi is used a tune in slow tempo, it give an elegant impression that goes through Dashi. 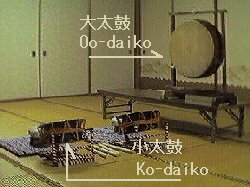 Children play by using only two Ko-daikos (small drums). Modori-Bayashi is played in the way where Dashi passes to the 2nd degree. Modori-Bayashi is used a tune in quick tempo, chirdren play by using a Oo-daiko (large drum) and two Ko-daikos. Machi-Bayashi is played on the occasion of when Dashi is stopping and a rest. Neri-Bayashi is played When Dashi becomes be near the town of oneself. A tune in very quick tempo is used to raise a mood. Children hit and even the one becomes complicated, detailed.